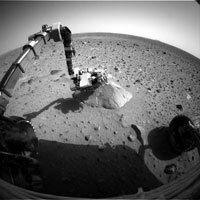 An image from Spirit's front hazard-avoidance camera shows the robotic arm extended to the rock called Adirondack. NASA's Spirit rover on Mars has resumed taking pictures as engineers continue work on restoring its health. Meanwhile, Spirit's twin, Opportunity, extended its rear wheels backward to driving position last night as part of preparations to roll off its lander, possibly as early as overnight Saturday-to-Sunday. Spirit shot and transmitted a picture yesterday to show the position of its robotic arm. "The arm is exactly where we expected," said Jennifer Trosper, mission manager at NASA's Jet Propulsion Laboratory, Pasadena, Calif. It is still extended in the same position as when the rover developed communication and computer problems on Jan. 22. A mineral-identifying instrument called a Mössbauer spectrometer, at the tip of the arm, is positioned at a rock nicknamed Adirondack. Engineers have been carefully nursing Spirit back toward full operations for the past week. They are sending commands today for the rover to begin making new scientific observations again, starting with panoramic camera images of nearby rocks. Today's commands also tell the rover to send data stored by two instruments since they took readings on Adirondack last week -- the Mössbauer spectrometer and the alpha particle X-ray spectrometer, which identifies the chemical elements in a target. "We know we still have some engineering work to do, but we think we understand the problem well enough to do science in parallel with that work," Trosper said. Several attempts to get a full trace of data related to the rover's problem have only partially succeeded. The engineers might choose to reformat the rover's flash memory in the next few days. A health check of Spirit's camera mast is on the agenda for today. Another health check, of an actuator motor for a periscope mirror of the miniature thermal emission spectrometer, is planned for Friday. Halfway around Mars from Spirit, Opportunity's lander platform successfully tilted itself forward by pulling airbag material under the rear portion of the lander then flexing its rear petal downward. "What this did is drive our front edge lower," said JPL's Matt Wallace, mission manager. "The tips of the egress aid (a reinforced fabric ramp) are now in the soil. That makes egress look perfect. It's going to be an easy ride." The rover also retracted a lift mechanism underneath the rover, to get it out of the way for the egress, or drive-off. During Opportunity's sol 6, the martian day that started today at 10:26 a.m. PST, the rover will be commanded to lower the middle pair of its six wheels and to release its robotic arm from the latch that has held it since before launch. Yesterday, Opportunity used its minature thermal emission spectrometer on a portion of the landing neighborhood that includes a rock outcrop. The instrument identifies the composition of rocks and soils from a distance. Opportunity did not return the data from those observations before going to sleep for the martian night, but may later today. The rovers' main task in coming weeks and months is to explore their landing sites for evidence in the rocks and soil about whether the sites' past environments were ever watery and possibly suitable for sustaining life.